Bullying can transform even the best school into a forbidding environment for children who endure classmates’ taunting. The pain can last a lifetime, with hopelessness and powerlessness giving way to depression. Abuses are terrifyingly common. “It’s not limited to the few victims the public hears about who commit suicide, or those who turn to school violence,” says Jean Alberti, a Chicago-based psychologist and former elementary school teacher. Alberti’s generosity has enabled the Graduate School of Education to establish the Jean M. Alberti Center for the Prevention of Bullying Abuse and School Violence, a clearinghouse for information on anti-bullying research and programs. Alberti’s gift was the largest in the history of the Graduate School of Education. Her passion and advocacy for stopping bullying abuse will help schools break the cycle of negative behavior. For millions of young people who suffer silently, the center’s work could mean the difference between a hostile school environment and one in which they laugh, learn, make friends and grow. Give now to The Alberti Center for the Prevention of Bullying Abuse and School Violence. 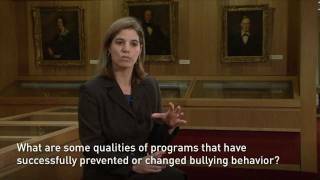 Parents, schools and others who want to stop bullying abuse need to act in ways that reflect good science and proven research, says Amanda Nickerson, director of the University at Buffalo's anti-bullying center.